In this tutorial we will be looking at how to exploit an authenticated command execution vulnerability in Wing FTP Server 4.3.8 and how to fix this security issue. Authenticated command execution vulnerabilities allow an authenticated attacker to execute arbitrary commands on the target system. In this situation the vulnerability is still ‘protected’ by an authentication layer because the vulnerability resides in the administrator panel. Unauthenticated command execution vulnerabilities are way more dangerous as they reside in publicly accessible places and can be exploited by anyone without authentication. Before we are going to analyse and exploit this vulnerability we will first have a look at Wing FTP Server in general and its extensive list of features. Wing FTP server is multi-protocol enterprise grade file server with a lot of features that runs on multiple platforms such as Windows, Linux, Mac OSX and Solaris. The file server supports many protocols: FTP, FTPS(FTP with SSL), HTTP, HTTPS, and SFTP server. Wing FTP Server is actively maintained with regular monthly updates, the latest release is version 4.8.5 which was released in February 2017. Some nice features I personally like about Wing FTP are the remote web based administration panel, the web based client, the virtual servers and of course the API’s. More information can be found on the Wing FTP website. The vulnerable part of Wing FTP 4.3.8 is the embedded lua interpreter in the admin web interface. This part of the software can only be accessed by an authenticated administrator user. In the case of Wing FTP on Windows the attacker is able to use os.execute() by supplying a specially crafted HTTP POST request or just access the web administrator panel. The os.execute() function in the lua interpreter can then be used for executing arbitrary system commands on the target host. When exploiting this vulnerability the executed commands will be in the context of the user running the vulnerable software. In the case of Wing FTP 4.3.8 on Windows the arbitrary commands are executed with system privileges as we will demonstrate in this tutorial. Before we are able to execute commands we need to have admin credentials to log in to the administrator panel. There are many ways to get a hold of credentials for web applications, depending on how they are installed and accessed. There are many Examples of ways to retrieve credentials. One of them is through SQL injection when credentials are stored in a database. Another option is through local file inclusion when they are stored in files on the server. 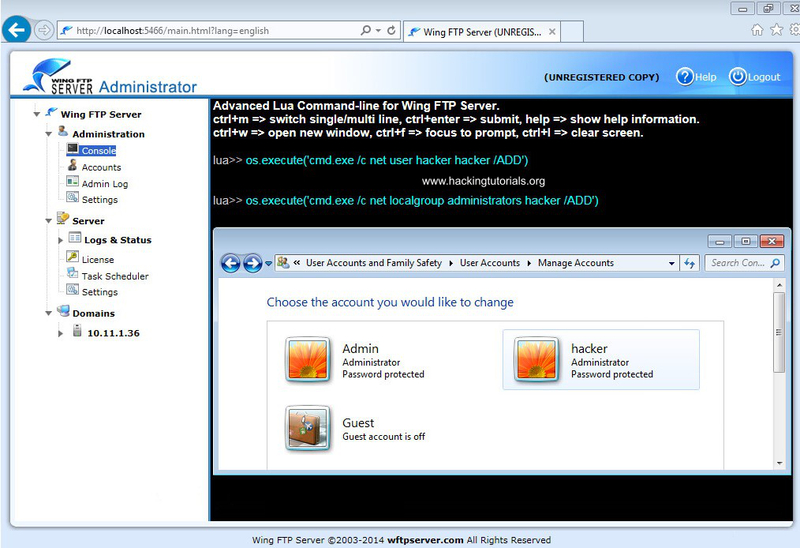 Let’s have a look first at how Wing FTP version 4.3.8 stores administrator credentials. Then we’ll have a look at how we can manually execute system commands using the lua interpreter in the administrator panel. 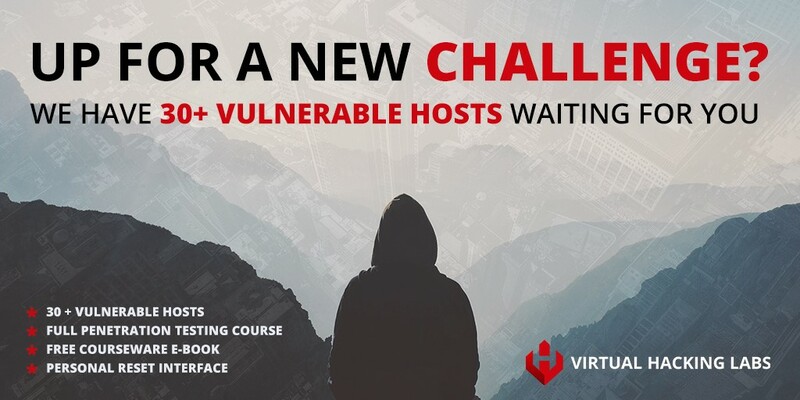 Finally we will demonstrate how to exploit this vulnerability using Metasploit. The file containing the admin credentials is located in the Wing FTP server folder in program files. The admins.xml file contains the hashed password for the admin user. 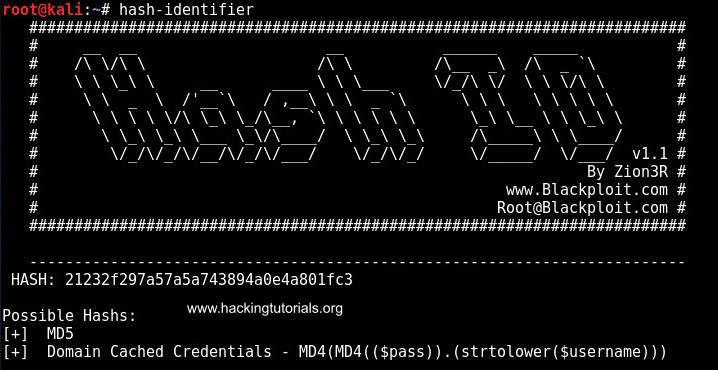 Hash-identifier is a great tool to identify hashes. The Python code is executed from the command line and MD5 hashes the value ‘admin’. As we can see the hashed value is identical to the hash in the admins.xml file which confirms that the password in the admins.xml file was MD5 hashed. Using MD5 hashes (salted or unsalted) for passwords nowadays is a potential security issue. Not because of MD5’s cryptographic weaknesses but because it can be brute forced very fast and lots of password hashes can be found in online databases. When attackers retrieve the contents of the admins.xml file through a local file inclusion vulnerability for example, you better be using a very strong password. Let’s continue with manually exploiting the authenticated command execution vulnerability through the administrator panel. 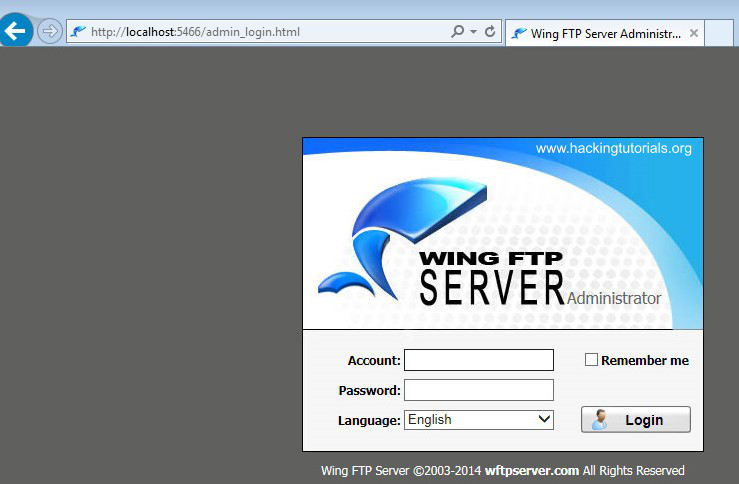 Wing FTP Server administrator panel login. The Wing FTP server lua command line. This is where we can exploit the vulnerability to execute system commands with system privileges. The console uses the lua scripting language which is an embeddable scripting language that can be found in many software programs. When you type the ‘help’ command on the console you will be presented with a list of commands that you can use to control the Wing FTP server. You will also notice that executing system commands is not one of the options. Let’s have a look at how to execute the system commands manually. The vulnerability description mentions that we can execute system commands using the os.execute() function. Let’s try to use this function to create a new user named hacker on the Windows system and add it to the local administrator group. The new user has been added to the system using the os.execute() function on the lua command line. When we open the user accounts from the control panel we can see that the new user was successfully added with administrator privileges. Let’s see how we can exploit this vulnerability with Metasploit in the following part of this tutorial. Active the wing_ftp_admin_exec module in Metasploit. Set the required fields for wing_ftp_admin_exec. The developers of Wing FTP server are actively maintaining the software and improving security. The authenticated command execution vulnerability has been fixed in versions later than 4.3.8 and updating to a later version will fix this issue. It is always advised to keep all the software up-to-date, especially applications that are accessed remotely. The most important lesson learned from this tutorial is that strong passwords can also protect vulnerabilities from being exploited. This specific vulnerability demonstrates clearly how important it is to use strong passwords for several reasons. When attackers cannot access the vulnerable part of the software, they are generally unable to exploit it. Also when an attacker is able to retrieve the file containing the MD5 hashed password through other vulnerabilities, a strong password can prevent the hash from being brute forced. im getting all this well not all of it i dont know how you set up your own password, but anyways i follow the exploit use username admin pass admin etc it goes to 100% and says exploit complete, but it doesnt create a session. do you have any ideas that I can try? When successful exploits do not return a session you should first check the settings for the payload, is the LHOST correct? Is the listener setup my Metasploit correct (LHOST:PORT)? Are you using the right payload? Also check if you’re able to exploit the vulnerability manually. hello, i have been trying to figure this out all day. I get everything set up and it runs and goes 100% then it states exploit completed no session created. I am wondering if you can suggest anything? MATT i had the same issue. How did you solve it? Are you targeting the right port? i have the same issue and i am sure my ports and ips are correct. Sometimes it can take a few tries too, you can try to run the exploit again and then check your active sessions (command: sessions). Eventually it will work. Good tut, thanks. So the metaploit exploit is fine but I’m trying to do it outside of that. I’ve created a meterpreter x86 windows exe payload connecting to a multi/hnadler but can’t appear to get it working. I’m using the lua command os.exec(‘cmyexploit.exe’) – should that be working or is the lua syntax wrong? Great to hear that you liked the tutorial! Yes, there is a syntax error, please check the tutorial again for the right syntax (Manual Exploitation section). I got there in the end although not with the syntax if your tutorial. The correct syntax was c:\foldername\exploit.exe – the double backslashes did the trick where everything else failed.